I haven't written an update on Little Dude's new developments for a while, since we've been busy crafting and exploring the outdoors. I'm happy that he's been picking up words so quickly that we have to think twice before saying anything before him! He has mastered sentences, and takes his time to speak sometimes because he's trying to form the right word in his mind. He likes using big words, and some of them come from the time he is spending on various screens. I do try to limit his time, but I guess there's no escaping that he will watch TV or videos on the laptop. But I try to make sure that at least he's learning something from them, and he seems to have picked up some phrases that seem funny when a toddlers says it! I thought I would share them here, although he may have picked up a few from me or his Dad. I LOVE jumping on pillows! I love this phase where he's trying to say everything he's learning. And everyday is a surprise. I think that's one of the best things about toddlers - they surprise you by how fast they grow. I know what you mean! We were at that stage too, and it happens even now. You should! I would love to make videos too, but don't always catch the right moment. It's so sweet to hear these kind of things! Funny that our children learn to talk (mostly) from us...I wonder if they find things we say funny or sweet too! That is so sweet! I don't correct some things too, because they sound so cute and I want to hang on to these quirks for a while. Thanks Jenny, I must check out your Friday feature! 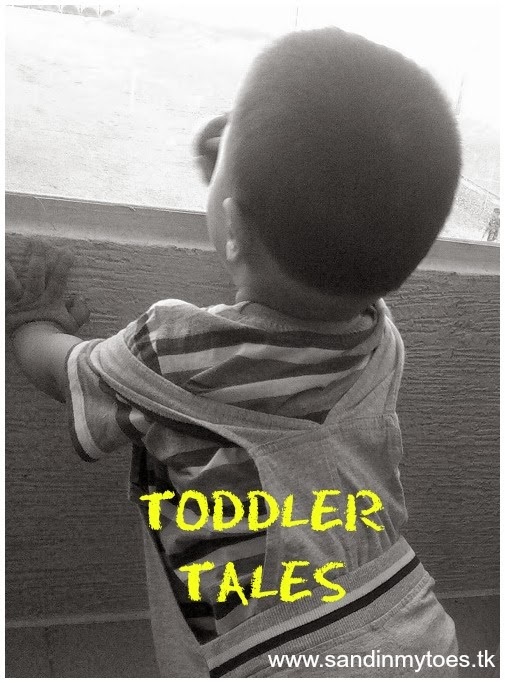 Yes, Caroline, toddler talk is so special, I just had to record it! He really is coming on with his talking. You know they are picking things up quickly when you have to watch everything you're saying! He has some cute phrases.